Travel firm Thomas Cook is closing 21 stores across the country and cutting more than 300 jobs. The company said 102 customer-facing roles would be axed as a result of the store closures, while it planned to cut a further 218 jobs "following a review of the retail workforce". It said holidaymakers continued to switch bookings from stores to online. 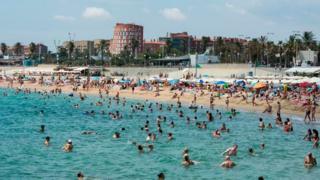 In September, Thomas Cook said profits would be hit after the summer heatwave saw many take their holidays in the UK. It issued a second profit warning in November, when it said winter bookings were also down. The shop closures will take the number of Thomas Cook outlets down to 566. It said a consultation with staff and unions had begun. The firm's chief of tour operating, Will Waggott, said: "Today's announcement reflects the wider challenges seen on the High Street, with more and more customers choosing to book online." Thomas Cook said 64% of all its bookings in the UK were made online last year. It added that the job cuts and store closures were part of plans to "streamline" the business. Manuel Cortes, general secretary of transport union, TSSA, said: "This is a devastating blow to all those involved. We are seeking urgent talks with the company and will be doing all we can to ensure the best deals possible for our members at Thomas Cook. "The company is reported as saying a sharp fall in holiday bookings has created the need for it to reappraise its business model. Make no mistake the uncertainty caused by Brexit is the underlying cause." The majority of stores being closed were not profitable, and were chosen for closure as their leases were due for renewal, a spokesman said. As well as weather-related woes, Thomas Cook has faced competition from online travel agents and low-cost airlines. It has also said political unrest in holiday destinations such as Turkey has been disruptive to its business.